New York Yoshinkan Dojo is committed to teach aikido that is true to O'Sensei's vision of Aikido as a peaceful, beautifl and powerful martial art at the same time. Yoshinkan Aikido allows us to learn Aikido techniques in a structured and systematic way. Additionally, practice of basic movements and continuous attention to aikido principles enables our students to build a strong posture and balance, resulting in strong and stable technique. Practical Aikido offers a boot camp like training. It consists of selected aikido techniques that, when mastered, can be effectively used for self-defense. Sessions designated to one or two techeniques and last 3 hours each. Class size is limited, but the minimum class is 6 students. Nikajo osae is a control that can be quickly applied to lock up an opponent's body and unbalance it. Nikajo is applied to an opponent's writst and can be used against all kinds of grips and strikes. 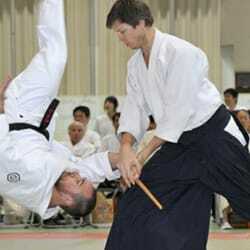 Kotegaeshi can be used as a throw or control and applied against strikes and most grips. Shihonage is a universal technique that can be equaly effectively used against grips and strikes.